One of the Three High Passes in Khumbu. Trail running/hiking shoes (or both). Personally I walked the whole three passes trail with Salomon SpeedCross 4 GTX and I can definitely recommend them. Good down jacket for cold evenings in lodges. Base layers. Check out merino wool base layers for torso and legs. Underwear and socks. You will need to evaluate your level of hygiene and how often do you want to change them. Trust me, it is ok to change them even every 3-5 days. T-Shirts, pants, buff and hat. You want to stay warm during the trek. Gloves (2 pairs – warm and thin ones). Rain and windproof jacket. Windstopper is definitely recommended as it gets really windy up in the mountains sometimes. Warm or down sleeping bag (at least -5 Celcius comfort level). Hiking poles. I can recommend black diamond hiking poles. Sunglasses. Some of the days will be very sunny. Especially if you will decide to climb the Island Peak. Personally I used Julbo Explorer Cameleon and was very happy with them even on the most sunny days. Snacks for lunches. Have some snickers bars, nuts, dried meet or fruits. Honey, crackers, peanut butter also works well. Water purifying tablets or filter (if you are panicking take both). Water is not the most cleanest thing in Khumbu as there are many horses and jaks on the trail who might be peeing and pooping in the rivers and water sources. Have tablets with you and purify every bottle of tap water you want to drink. Vaseline is a must-have thing on the trail as the sun gets very strong and your lips get dry. Powerbank is a good thing to have. Most of the lodges on trail will try to charge money from you for charging your phone or camera. Solar charger. This thing saved me a lot of money during my hike. Use it during the day, when the sun is strong. You can charge your powerbank, watch, camera, phone and whatever else you need to charge. I used 24W Rav Energy solar charger which was very strong and I can definitely recommend it. Chargers for your phone, camera, batteries, watch and everything else. SIM card is working in Lukla, Namche Bazaar, Tengboche, Pangboche and some other places in Khumbu. If you want to save your money on internet get one in Kathmandu. Check out my article about staying online during your trek – SIM card for Everest base camp trek. Hiking map, Maps.me app or GPS device for navigating on the trail. It is quite hard to loose the trail, but it is nice to know where you are exactly, so get a map in Kathmandu or download the app for your phone. Flashlight. Get Black Diamond or Petzl headlamp, you will need it for Island Peak, early morning hikes or trekking after the sunset. Nepalese ruppees is the best currency to have during your Everest base camp trek as the lodges will charge you in NRP, not USD. Insurance. Don’t forget this one. You never know what might happen on the mountain. Good and comfortable backpack to fit all your stuff. Credit card is a good thing to have if you will have some health problems and will need evacuation. Also, if you will want to buy something expensive, like Island peak tour you can pay for it by your credit card. I think that’s all I had during my 18 days Three Passes trek in Khumbu. Sometimes I thought that I even had too much clothes. 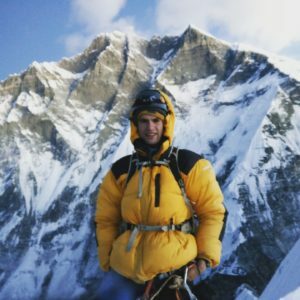 A good friend of mine actually hiked in Everest! I enjoyed reading your list of necessary items to bring with, it was very helpful. Did he do a EBC trek or Three passes? 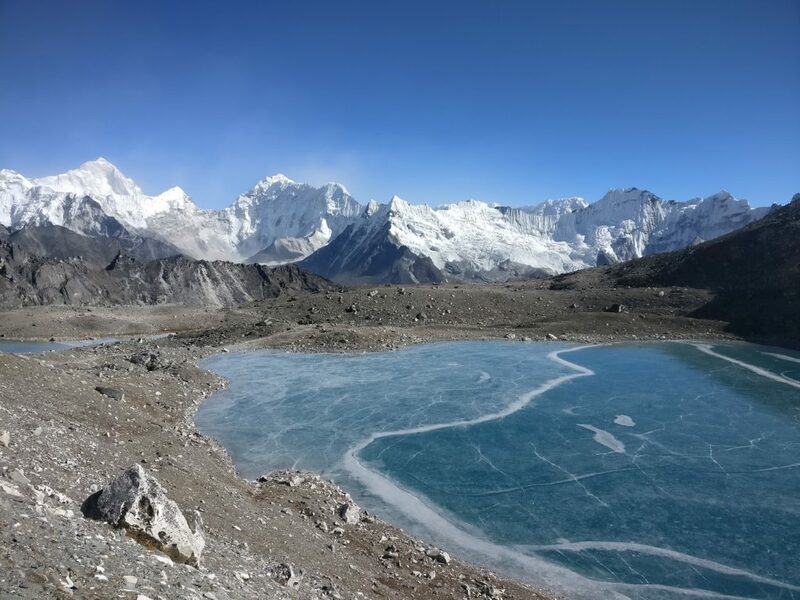 Or maybe he went up to Gokyo Lakes? Thanks ! Whooa lovely photo. Thanks for your tips on the gear! Do you know if it is possible to rent some of the gear somewhere in the area? I am glad that I helped you, Ženja. I don’t think that you can rent some gear somewhere on the way. But you can definitely buy some stuff if you forgot something in Namche Bazaar. Although, prices are higher there… Also, if you want to rent a gear while in Nepal before your trek to EBC or Gokyo Lakes do that in Kathmandu! You can find a lot of options there, many shops, original and fake brands. What a shot! I was stranded on that image for few seconds. Nepal is on my travel bucket. Thanks, Rajat! Nepal is definitely a good place to spend some time. Especially if you are interested in hiking and nature. Great comprehensive list. This would be such an amazing experience!! It definitely is amazing experience to hike in Everest region and Sagarmatha national park, Elizabeth. You should definitely do that! This is a really great and helpful list. I would never be able to do Everest but this is great for those that would! EBC trek is definitely doable for anyone. It only depends how fast do you want to do it. But to actually climb the Everest peak I agree, you need to be really physical fit. Do it next time, Kaitlyn! I can only say nice things about this place. What a great list of items to take on a hike. I really want to find a good backpack. It sounds like you are ready for a great trip. I can recommend Osprey backpacks, they are really good quality and last for a long time. This is one of my dream treks that I will probably take in June this year. Thanks for this informative post. Do it, Anshul! To hike in Sagarmatha National Park is amazing experience. Very helpful list for hiking this trek! I can imagine being well prepared for this hike would be key to finishing it! Yeah, you definitely need to be well prepared for hiking EBC or Three passes treks. One must have warm clothes, down jacket and some snacks. I’m thinking of doing EBC next year so these tips have come in very handy. Thanks for sharing such an informative post. Have you thought about doing Three Passes trek instead of EBC? It is much longer and more interesting, not so many people on the way. This is a very informative article! I find anyone who can undertake Everest very inspirational. It is amazing you did this journey for 18 days! It is not exactly Everest. It is Everest basecamp trek. Also I did the Three Passes trek which was longer and more interesting than the traditional EBC trek. What an extensive list of gear. This is one of my dream trips to make some day. Will bookmark for future planning. An off-topic suggestion though, how come you haven’t put any affiliate links in your recommendations? Do it! It is wonderful experience for sure. I am waiting for my posts to rank better and maybe then I will put some links here 🙂 Thanks for advice! I never done any hiking in my life, but these checklist is really helpful, especially for beginners, to avoid making mistakes. I hope I can maybe even just once. Thanks for sharing! Hi Chua! It depends what kind of shoes you like. A lot of people recommend high hiking shoes fro EBC trek. But I did the whole trek with Salomon Speedcross 4 and I was totally happy. They are light and they have good grip with the surface. You should try hiking shorter treks before EBC and decide which shoes will fit you best for EBC trek.